Those who attended a wedding Saturday, June 28, 2003, in the peaceful surroundings of a farm in the Hatcher Hall community of Overton County experienced a not so ordinary event. The weather cooperated nicely in that the humidity for late June was not nearly as high as normal. The unusually rainy weather we’ve experienced this spring and early summer added to the beauty of the lush green fields and surroundings for this outdoor wedding. As guests began to arrive, they were directed to park their cars in a nearby field, and as time drew near for the ceremony to begin, everyone walked across to another field where bales of hay covered with quilts had been placed for guests to sit on. The bales of hay were filled to their capacity. 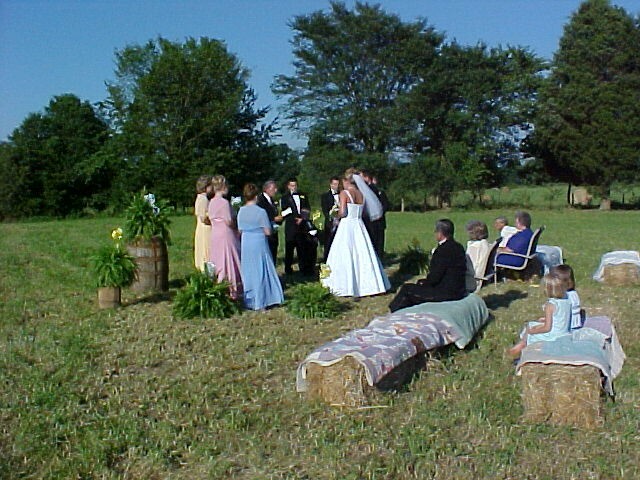 When the ceremony began, the mothers of both the bride and groom were escorted to their places where they were seated in chairs at the front of the hay bales. Next, the minister, the best man, the ushers, and the groom, all of which were dressed in traditional tuxedos, walked across from the barn to wait for the bridal attendants and the bride to appear. Recorded music broadcast from large speakers that had been placed near to where the guests were seated was used. One by one the pretty girls in soft pastel colored dresses, along with an adorable little flower girl, proceeded to take their places along side the groom and his attendants. The appearance of the bride was next. She arrived by way of a horse driven carriage. A beautiful Clydesdale horse was used to pull the carriage, and upon their reaching the area where the guests and wedding party awaited her arrival, she was helped down by her father who then escorted her to be presented to the groom and the other wedding attendants. 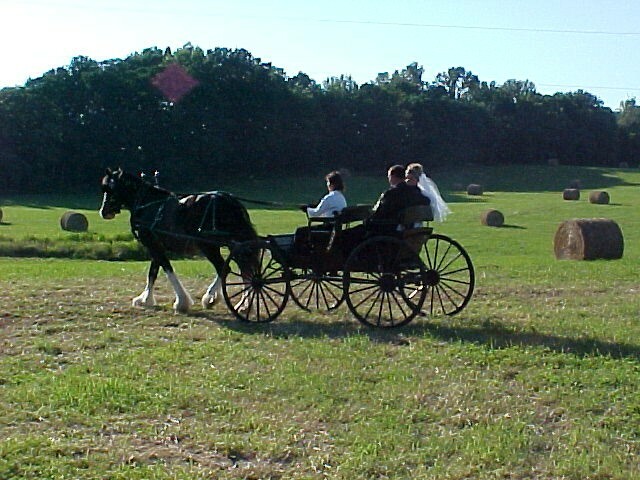 The vows were exchanged and following the ceremony, the happy couple took a carriage ride around the field before stopping near the barn where the receiving line was formed. Quests then entered the barn for a bountiful selection of delicious refreshments. Picnic tables had been set up inside and outside the barn for the guests to sit at while enjoying the food. The floor area of the barn had been covered with heavy black plastic. It was indeed a very different ceremony, the likes of which probably no one there had witnessed before. The young couple have been raised during a time when lasting relationships don’t seem as important as they once did, but everyone who knows and loves Rebecca Beason, daughter of Cletis and Anita Beason, of the Barnes Ridge community in Pickett County, and Scott Gunnels, the son of James and Marie Gunnels, of the Taylors Crossroads Community in Overton County, wish for them a lifetime of love, devotion and all the good things that make a marriage last. If having a wedding in the not the usual style would guarantee that they live happily ever after, these two have got it made. Scott and Rebecca, here’s wishing you all the best in your new life together.